Say the moon is drifting further away from Earth at an astonishing rate of 3.14159km each year due to the crazy tides, the rising sea level and shielding us from stray asteroids. Given 150 years time how can we secure the Moon so that the rate stays within an inch annually on average at peak? Not that it will affect our lives much but I still hope to celebrate the Chinese moon cake festival on time with my fellow werewolves clan. The Moon provides long term stability to the Earth (moderating precession of the poles, for example) and it is thought that without a massive moon, life, or at least complex life on Earth might not even be possible. However, planetary engineering is also quite difficult, so if you are worried that the Moon will drift away in a billion years and you will not be able to enjoy Moon Cake then, you will need to be prepared to expend a lot of time and energy modifying the orbit of the Moon. Moving the Moon or a planet requires changing the momentum of the body. Conceptually, you could move asteroids and do flypasts of the Moon, adding or subtracting energy and momentum from the asteroids as they fly past to change the momentum of the moon by a corresponding amount. Since the mismatch in mass and energy os so great, after an asteroid flies past the Moon, it needs to deploy a solar sail, add or subtract energy and be placed in another crossing orbit. The authorities on Earth will be somewhat perturbed by the high speed asteroid traffic passing between the Earth and the Moon, since any miscalculation will lead to an extinction level event. Werewolves will become targets of angry mobs with pitchforks and astrophysicists. 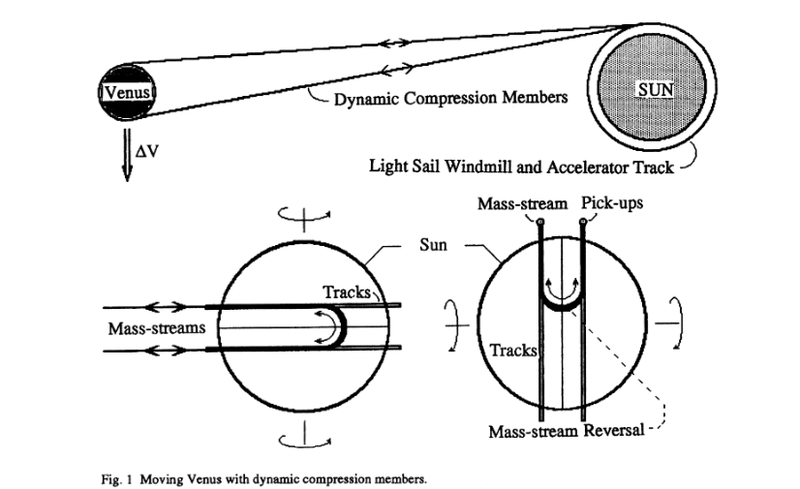 Paul Birch had some alternative ideas, ramping up momentum exchange by accelerating streams of particles via "light sail windmills" and using them to push planets around, change the rates of rotation and other fun tricks. His calculations suggested that Venus could be moved into an orbit similar to Earth in @ 30 years with an energy input of "only" .2% of the luminous output of the Sun. Running into the pellet stream coming from the "light sail windmill" or suffering some sort of mechanical failure of the catching device on the Moon will give an entirely new meaning to "bad news". Pitchfork carrying mobs of astrophysicists will be the least of your worries at that point. So long as you are willing to put in the time and effort, moving planetary bodies around, changing their orbits and even tweaking them a bit is entirely possible. If you can do this well, I understand there are a few job opening in Magrathea for people with these talents. Slartibartfast says he should be your point of contact. The cost and effort of performing this task isn't economical - mankind will still function perfectly well without the moon being there. A good solution to that option is to raid the moon base and/or the relay station that is coordinating all the plan along and assassinate the leadership. Either that or simply bombarding the hell out of the space rockets. The moon is under a gravitational force which is strong enough to pull it yet close enough to it and away from us to pull it away from the earth itself due to greater force applied on it itself. A good reason to that is some gravitational source which is immense such as a black hole, or a star sized spaceship arriving near the area due to star jump. This is a problem which is harder to solve due to the fact that both are attracted, to that I recommend to move humanity and laycans alike to a different planet altogether! As for keeping the moon itself? Not likely. Those are the options I'm seeing, but who knows, maybe others have better ideas. Not the answer you're looking for? Browse other questions tagged earth moons gravity orbital-mechanics tides or ask your own question. Can the Earth drag the Moon into its atmosphere? What would happen if you suddenly moved the moon to the other side of the Earth? Would An Earth-Like Moon Be Tidally Locked?